He's an Italian Greyhound who belongs to one of our best friends, who's out of town on business this week. And he thinks he and I have some special psychic connection, which he attempts to activate by sitting next to my desk and staring at me like some sort of deranged, obsessive serial killer. It's a little disconcerting after a while. He's freaking me out, man. I've got a real soft spot for Greyhounds. Where they are raced, unless someone intervenes, they're just put down or put out on really crappy farms where they're barely maintained. My brother (a vet) regularly takes them in as part of an organization to save them. Assuming they're healthy, they're used as blood donor dogs in the animal hospital until they can be adopted out. He's usually got one or two of them on hand at a time. Nathan, I like greyhounds, too. There's a track here in Denver, so you see a lot of adopted retired dogs in town, and the rescue organizations work closely with the track to prevent abuse. 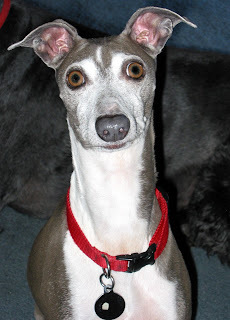 Jake is an Italian greyhound, though, so he's quite small. His miniaturization has given him an unfortunate bug-eyed quality, in spite of being beautiful in the lithe way of his larger cousins. He's cute in that picture. ;) Is that Boogie I see behind him? MWT, that's my Boogie. he outweighs Jake by at least 70 pounds. That look is making me think of a cartoon character. For the life of me I can't think of which one. Janiece, you have my sympathies on babysitting a neurotic bizzaro dog. Mommy, the scary puppy is frightening me. "I really gotta go outside now"
"This is your dog on drugs"
"Note to self, open mouth when barking." He looks like one of those greeting card dogs that have the photoshopped bug eyes or cheesy grins - except there's no photoshopping there. I think he's practicing his ESP - treat levitation - and failing.